Holidays are a very memorable and joyous occasion that spreads happiness and love. 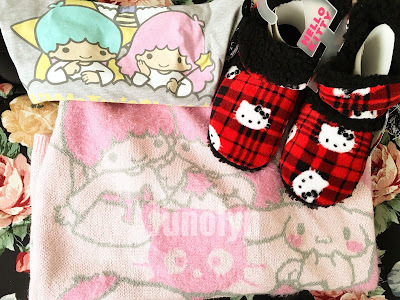 Little things like dressing up warmly in cute Sanrio themed pajamas while opening gifts on Christmas morning adds to one of the most favorite seasons of all. Christmas songs are playing in the background, while the house is bustling with energetic joy. During this holiday season, you'll be seeing a lot of Sanrio addicts drinking egg nog or hot cocoa from their favorite Sanrio character mug. In the morning light, Christmas themed Sanrio character glass ornaments shimmer along the Christmas tree. Underneath the tree, presents are beautifully gift wrapped in Sanrio themed wrapping with huge bows made of Hello Kitty or My Melody figures. 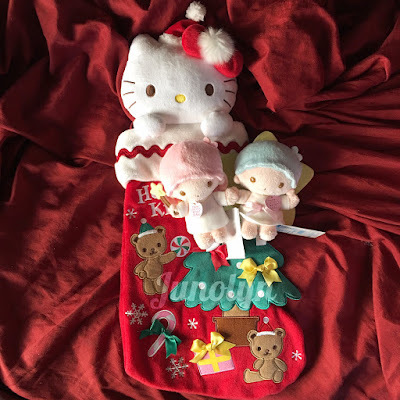 Next to the pile of gifts lay a giant sized Hello Kitty plush with a beautiful vibrant red bow tied around the neck. This season marks the time where Sanrio collectors can dream of a Sanriofied Christmas because years ago, no one could have imagined the possibilities.